Teams all over the world are preparing for this year’s highly anticipated Melges 24 Worlds in Miami, FL – including Travis Weisleder’s, Lucky Dog Racing. Quantum’s Director of Offshore One Design, Scott Nixon, describes what the Lucky Dog Racing team learned about matching leeches upwind and how that can be applied regardless of the boat you are racing. Mainsail in 16 TWS. Tight rig tension. ¾ tight backstay, ¾ tight vang to flatten main and add upper twist. Photo courtesy of Scott Nixon. 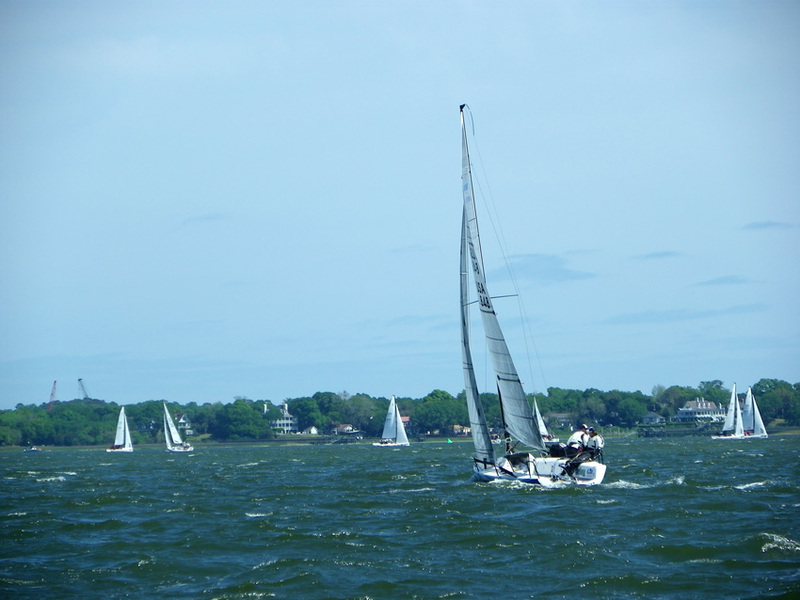 Charleston Race Week 2016 was sailed in near perfect conditions for all three days this year. Winds were NE in the 12 to 22 knot ranges with relatively flat water. I sailed with Travis Weisleder and his Melges 24, Lucky Dog Racing. We are currently preparing for the upcoming Melges 24 Worlds off Miami Beach this November, so we have been sailing this past winter in the ocean with large waves and chop. Race Week was held in flatter water, but we took away some valuable lessons regarding upwind set up no matter the sea state. Upwind the boat set up is always critical to having good speed and being able to hold a lane on the starting line. If you can set the mainsail and jib up so the leeches twist together, the boat will have better balance and track better. If the jib is trimmed too tight the mainsail will get back winded near the mid luff area. If the jib is too loose the slot will be too open and the boat will not have good height, which is critical to living in tight lanes in big fleets like the Melges 24. Before the jib is set up perfectly you must first get the mainsail (the main driving force upwind) set up properly for the conditions. In overpowering conditions, like Charleston RW this year, the rig tension must be tight, so that the mast can handle a tight backstay and vang. Adding vang and backstay will help the mainsail flatten and twist. You will notice this by seeing the upper third of the mainsail quite flat near the top draft stripe (see image 1). Also this will make the upper leech very open, so the boat has some power but not too much in the 15+ TWS where you start to heel too much. Melges 24 jib in 16 TWS. Lead aft 2 holes from base (3rd screwhead from aft on track), eased sheet 2” with tight rig and straight headstay. Photo courtesy of Ed Baird. Once the main is set up it is time to get the jib set up matched to the mainsail – ensuring the boat has great balance, less helm, and is easier to drive. 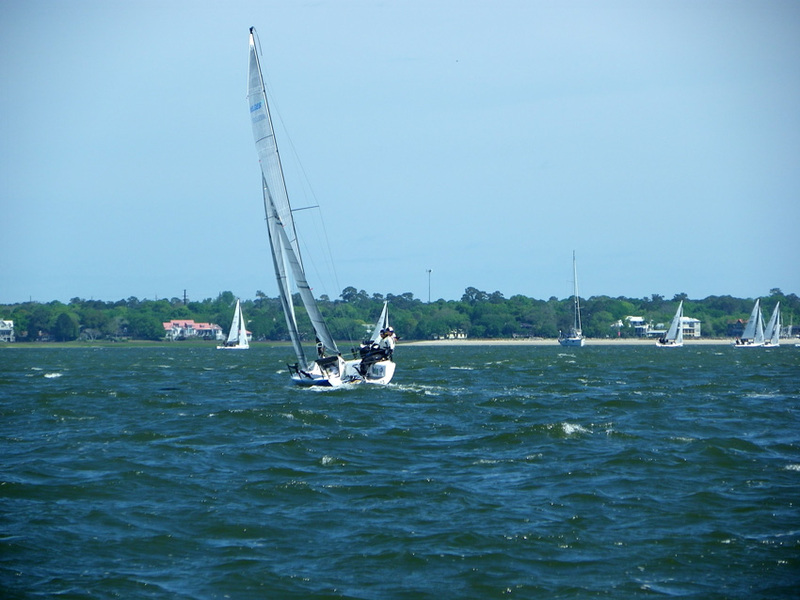 This was key in Charleston because the northeasterly winds are quite shifty and puffy, making it hard for the drivers to keep the boat from over heeling and sliding sideways in the puffs. 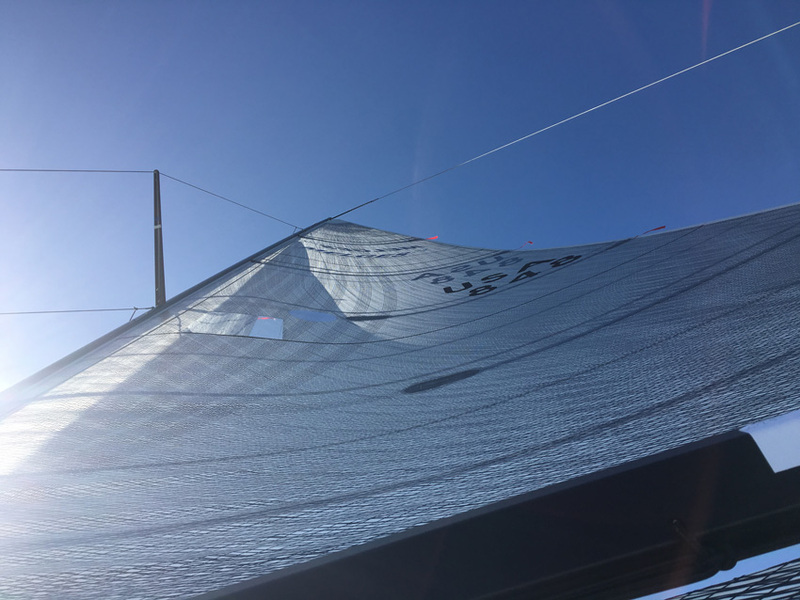 To twist the jib off and lose some power simply slide your jib lead aft a few holes on the jib track, so that when you sheet the sail the leech is not as tight as your base 10 knot settings. The aft lead will help the upper leech twist and spill the breeze. Sheet hard, but if you start to get backwind in the main ease the jib sheet until the main quiets down and the boat is easier to control. If you’re on a Melges 24, the sheet is normally eased about 2” in anything over 15 knots to help open the slot and twist the sail, so both leeches match and work together. Remember the Melges 24 jib is a skinny high-aspect sail, so a small ease down low on the sheet affects the upper leech a lot. Melges 24 Lucky Dog in 16 TWS in flat water with tight rig, twisted main and jib with matching leeches. Boat has good balance and is easy to steer. Photo courtesy of Ed Baird. Regardless of the type of the boat you race, when both leeches are matched the boat will feel better balance and be easier to drive upwind (see image 3). This means it will be easier to hit target speed and heel angle off the line and out of tacks. The wider groove will enable you to sail faster with the added twist and the added speed will help the foils work and create lift, so you are faster and higher! If possible have someone shoot some pictures from off the boat of your set up, so you can check to see how your leeches look and if they are matched (see image 2). You can also compare yourself to other teams that may be going better than you so you can fine tune for the next time you get that condition.